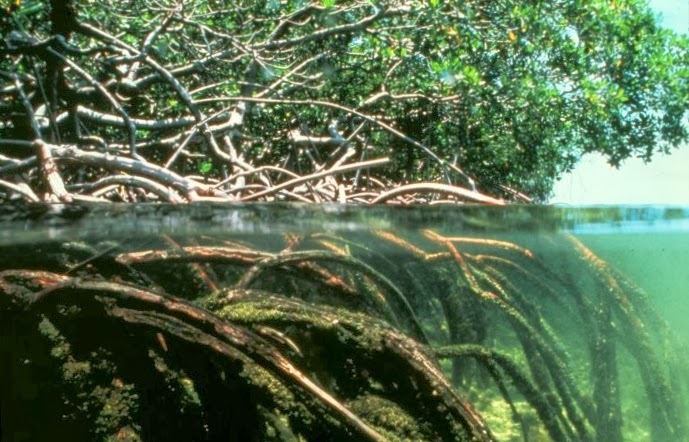 Will mangroves be an effective barrier against onslaught of stormy waves? In the aftermath of widespread destruction in Eastern Visayas brought about by super typhoon Yolanda last Nov. 8, 2013, the Department of Environment and Natural Resources (DENR) was immediately tasked to come out with an effective plan to at least mitigate the negative impacts of super typhoons upon the coastal areas in the areas devastated by the recent calamity . The DENR's task at hand seems to be a gargantuan feat that needs extra-cautious attention from those who are supposed to undertake the project. The topic I'm referring to revolves around a scheme that will identify coastal areas facing the Pacific Ocean to be planted with mangroves. km²) spanning 118 countries and territories." 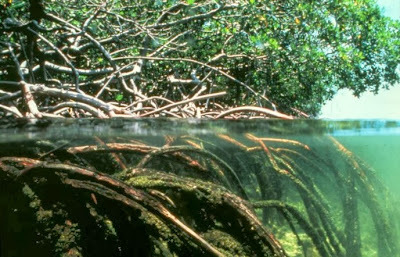 In a February 2007 National Geographic article titled "Forests of the Tide", Kennedy Warne wrote: "The plants' interlocking roots stop riverborne sediments from coursing out to sea, and their trunks and branches serve as a palisade that diminishes the erosive power of waves." This is exactly what Environment and Natural Resources Secretary Ramon Paje thought when he, along with his consultants, came out with a plan that is expected to address the impacts of "Storm Surges" as what happened to Tacloban City and Guian, Eastern Samar. Except for Tacloban City, which is located in the Letye Gulf, the town of Guian like the city of Borongan, is facing the Pacific Ocean. In an interview with ANC, Secretary Paje told anchor Pinky Webb that the pilot project would be launched at the coastal areas of Tacloban City and the town of Guian, Eastern Samar. When questioned as to whether the mangroves would be useful in protecting the houses in coastal areas knowing that storm surges measure at least seven meters high while mangroves only grow as high as five meters tall? Paje said that mangrove plants will be able to withstand the impact of the big waves by dissipating the mid-section of the waves before they could finally inflict heavy damage to the coastal houses. gusty winds reached around 300 kph. What's so special about this program is that selected survivors living within the coastal communities devastated by Yolanda would be hired to plant and maintain the mangroves until they become mature enough in five or more years time, Paje said. Aside from the mangroves, another alternative that anyone can ever think of is the building of parallel stone sea barriers that are far off from coastal shores. Perhaps, a pile of big boulders that is aligned to where the storm surges could possibly come from would be an ideal solution, too. This could either be cemented or not, depending on the availability of funds from both the public and private sectors. Why is there a need for these barriers? It is public knowledge that at least 20 typhoons lambast the Philippines every year. The worst months of the year come between July and November when strong monsoon winds and 30mm rains would develop within the Philippine Area of Responsibility (PAR). Of these typhoons, one or two can be considered strong enough to create so much destructions along their paths as what happened in Eastern Visayas, Central Philippines. "It's time to stop this madness," lead Philippine delegate Yeb Sano was quoted as saying at the UN climate conference in Warsaw on Monday, after Yolanda struck the Philippines on Nov. 8, 2013 that killed more than 5,000 people. In his address before 200 foreign delegates, Sano, who was fighting off tears, encouraged his counterparts to reach an agreement that will drastically reduce greenhouse gas emissions in an effort to halt global warming. "We refuse to accept that running away from storms, evacuating our families, suffering the devastation and misery, having to count our dead, become a way of life," Sano said during the climate change conference in Warsaw.